I was introduced to Fazioli pianos through my sister's piano professor. She had graduated from the Moscow Conservatory and successfully trained many professional pianists. During her lessons, the students were not allowed to touch her Fazioli, as she had a separate Steinway which the students were allowed to play. My first fateful encounter with actually being able to play a Fazioli piano happened over ten years ago when I lived in the United States. I had the privilege to go to a showroom in Salt Lake City that had 5 or 6 Fazioli pianos. I first played the F156. I was surprised at how such a small piano could produce such a strong sound. The sound was exquisite. I played all of the models, from F156 to F278. They were all magnificent. I vowed that someday I would own a Fazioli. And thus I started saving money to buy my dream piano, after moving to Japan. 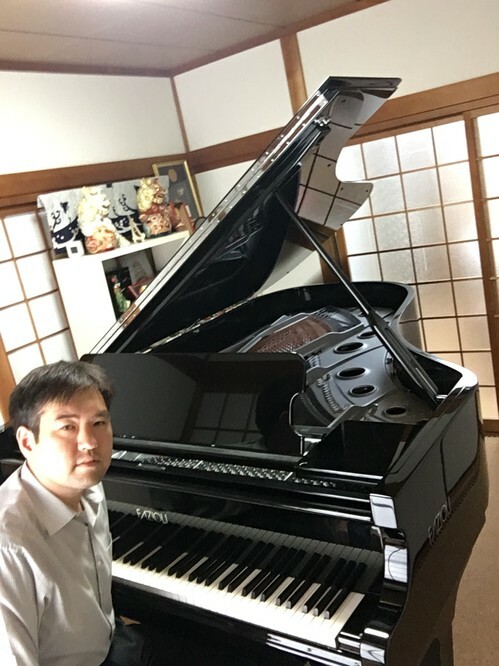 When I first visited the Fazioli showroom in Tokyo a couple of years ago, I was granted another opportunity to play a selection of pianos. I was struck again at the beautiful sounds from playing the Fazioli and I renewed my commitment to buying one someday. However, at the time, there wasn't one piano that I felt "This is it. This is the one". In January of this year I had a chance to go visit the showroom again in Tokyo. President Alec Weil showed me the different new models that were available. Among them there was also a silver used F228. I was intrigued because used Fazioli pianos are so rare to find. I also learned that it had been used in a concert hall and many of the top pianists in the world had played it. The piano, having been broken in, made it easier to play. Additionally, the sound was exceptional compared to the other pianos. • The whole range of sounds when playing a Fazioli work in perfect harmony. Even while playing multiple notes, it does not become muddied. All the notes are perfectly clear. The high notes, middle notes, and low notes all work together harmoniously to produce wonderfully rich and lovely tones. • Especially the larger models have such a fantastic balance in the tones. The high notes are bright and radiant, the middle tones are rich and creamy, the low notes have such power and strength. It's perfect. • Playing a Fazioli changes your perspective of what music is and what beauty is. It helps, not hinders your ability to express yourself artistically. It guides you to what the composer and piece is trying to say. It is the ultimate piano. • No matter the pianist, playing a Fazioli makes you sound so much better than your skill level. The silver used F228 was the piano that really left an unforgettable impression. I was overwhelmed at how beautiful it sounded. It was exactly what I was looking for. Since purchasing the Fazioli, I have had the pleasure of being able to play for hours every day. It's indescribable how huge a difference playing such a world-class instrument makes. It's opened up a whole new way of thinking and a whole new world of music.